Apple on Friday updated its developer website with fresh iOS 11 adoption statistics, revealing 65 percent of compatible iPhone, iPad and iPod touch devices are now running the current generation operating system. With iOS 11 adoption hitting 52 percent in November and 59 percent in December, the latest data measured on Thursday shows adoption rates are on a steady upward trajectory, gaining about 6 to 7 percent per month. Apple notes 28 percent of devices continue to run an iteration of iOS 10, while 7 percent are on older versions of the operating system. The new information was shared in a post to Apple's App Store support webpage for developers. Unlike third-party sources, Apple gleans its data from App Store visits to provide a more accurate representation of iOS adoption figures. Released in September, iOS 11 has seen respectable uptake by consumers, but the OS still lags behind its predecessors. 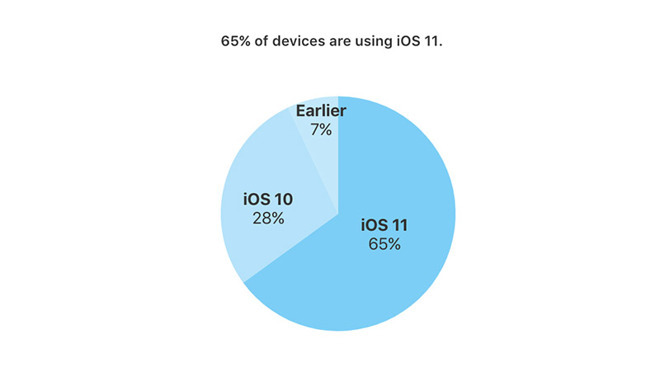 Last year, Apple data showed iOS 10 installed on 76 percent of compatible devices in early January, while iOS 9 adoption was pegged at 75 percent at roughly the same time a year prior. Though it carries a number of desirable features, like an iPad-centric user interface improvements, ARKit support and Apple Pay Cash, iOS 11 has been beset with software bugs ranging from usability issues to security vulnerabilities. In December, a particularly nasty date-related bug caused some devices with local notifications enabled to enter a crash loop, forcing Apple to push out iOS 11.2 earlier than planned. Prior to that, an odd autocorrect bug that cause the letter "I" to be swapped out for the letter "A" and a question mark icon. More recently, researchers discovered a glaring HomeKit flaw in iOS 11.2 that granted unauthorized access to internet-connected devices controlled by Apple's smart home platform. Apple patched the hole by disabling guest accounts before permanently fixing the problem in a subsequent iOS release.